It certainly doesn't come easy, but that's what we want. Getting to Panama City or San Jose, CR is easy. Getting to the islands of Bocas del Toro takes a new flight. Whether you fly to Panama or Costa Rice (they are equidistant to Bocas) you'll need to change airports and fly on a small plane. If you fly into Panama City, grab a jumper with PanamaAir. Fly from San Juan, Costa Rica and you should take the Nature Air jumper. Interamerican Highway up to entrance to Gualaca (10 Km). Turn to the left and go to the end of the road to Chiriqui Grande (98 Km) and then, at Punta Peña, the road to Almirante (68 km), where you can live the car in a parking. Roads are paved, in good condition. Beautiful views in the mountains. 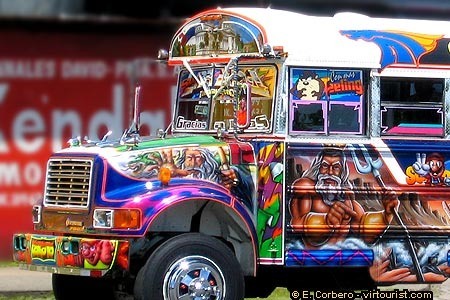 Chicken Buses are an iconic part of backpacking Central America. They're cheap, crowded, and decorated like no other. Fortunately, the name is antiquated and you probably won't find any chickens on-board. How does the driver see out of the windshield that's painted to look like a graffiti-ed overpass in Harlem? Answer: he probably can't see much at all. Ride chicken buses at your own risk! Take the bus to Almirante from the Panama City terminal. Once you get to Almirante it is best to take a marine taxi ($4 - 30 minutes) or a ferry boat (2 hours) to Bocas. The ferry boat from Almirante to Bocas del Toro only runs Mondays to Saturdays.